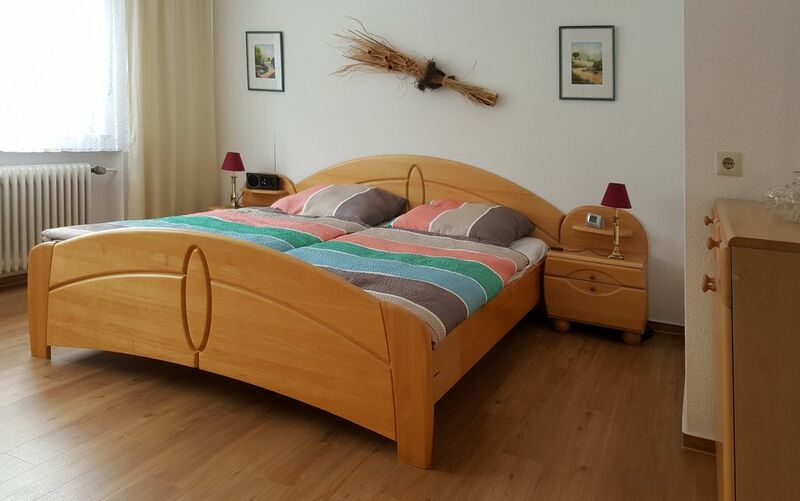 The holiday home "Auberge Jolie" - with comfortable and stylish 135 m² living space - is for everyone the city-domicile, the Aachen, the Eifel, the Ardennes, the High Venn, Belgium or Holland explore and thereby an accommodation with space and comfort inhabit would like to. No matter if you want to drive through the region by car, by motorbike, by bus and train or by your own bike, here is room for everything. "Auberge Jolie" is designed for 4 + 2 persons. For 4 people there are two bedrooms and 2 more people can sleep on the air-folding sofa in the attic with a bed size of 160 x 200. Please note that the stairs to the attic are only suitable for physically safe persons. You can always put your own cot in the bedrooms. Wunderbar: Alles da, was man sich wünschen kann, viel Platz, sehr sauber! Wir waren zu Viert und haben uns sehr wohl gefühlt. Das Wetter war schlecht, sodass wir immer durchgefroren nach Hause kamen, aber der Bus (3 Linien) fährt bis vor die Haustür und es wird schnell warm. Sehr nette Vermieter - rundum empfehlenswert! Vermieter supernett und hilfsbereit, gute Tipps für Gastronomie und Einkaufsmöglichkeiten. Das Haus ist liebevoll eingerichtet und es hat uns an nichts gefehlt (wie zu Hause), haben uns wirklich sehr wohl gefühlt und würden jederzeit wieder dort übernachten. Goed verzorgde woning met compleet inventaris. Met vrienden een weekend vertoeft. Prima verblijf. Alles wat je nodig bent is aanwezig. Openbaar vervoer (Bus) stopt voor de deur. Supermarkt op 200 meter afstand. Alles mooi schoon en de verhuurder is heel attent. Parkeerplaats naast de woning wat ook heel prettig is. Es tut mir gut, dass ich dazu beitragen konnte, so netten Leuten eine schöne Zeit in Aachen zu ermöglichen. "Auberge Jolie" is located in Aachen, district Haaren, directly at the bus stop - 10 m - direction Aachen center and is 250 m from the nearest supermarket. The next gas station can be reached in 2 minutes. In the immediate vicinity you will find a comprehensive infrastructure. The Aachener City can be reached by direct bus connection on the doorstep or in 5 minutes by car or motorbike. To the interchange Aachen direction Cologne, Dusseldorf, Belgium and Holland one needs with the car not 5 minutes. The Eifel, the Ardennes and the Hohe Venn can be reached by car or motorbike in about 20 minutes. The annual CHIO in the Aachen Soers can be easily reached by bus - (line + shuttle) - in about 20 minutes or by car in 5 minutes.